Claw Island was home to tigers, and was part of the Congo expansion which officially opened on July 26, 1977. 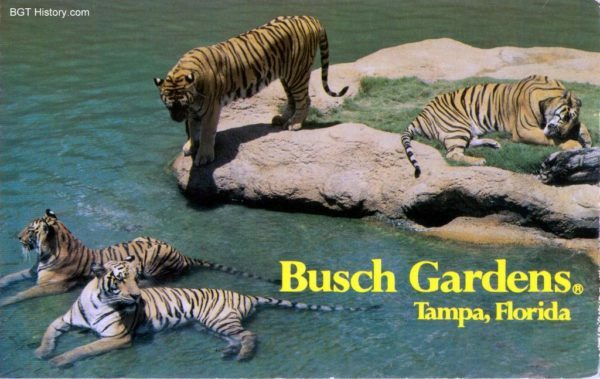 At that time, there were a total of 12 (or 16) tigers who called Busch Gardens home, with a maximum of six on habitat at one time. The habitat itself included a 10 foot deep moat surrounding the main island, and the tigers often enjoyed a swim in it. Claw Island included 6 shade structures on the path surrounding it for guests to enjoy, along with a bridge above the habitat for an overhead view of the tigers. All of the original tigers were born in captivity at other facilities, and moved to the park for the new exhibit. None of the tigers had any large bodies of water to explore before arriving at the park, but all took to the water quickly and enjoyed the amenity. An article in 1980 reported there were 12 Bengal tigers, and they could be seen in the habitat playing on the rocks, or cooling off by taking a swim or sitting beneath the waterfall. 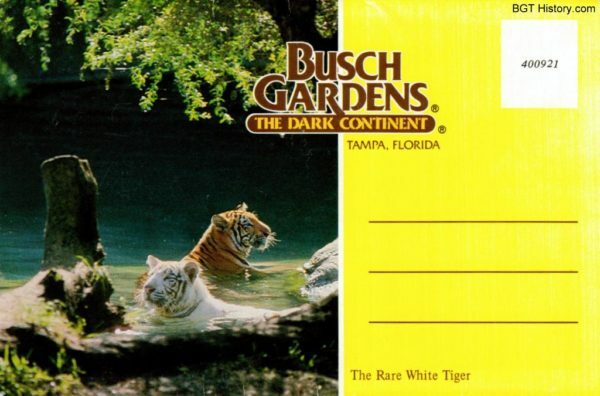 In early June 1982, the park received three Bengal tiger cubs from the Cincinnati Zoo, bringing the collection at that time to a total of 13. Two of the cubs were white – one male and one female born September 5, 1981 – and the third was a yellow female cross-bred with a recessive white gene born July 6, 1981. By September 2006, a demolition permit for Python and the surrounding area in Congo was applied for by the park. A newspaper article reported that while the park would not confirm the demolition of Python, that plans for an update to that area of the park were already in the works, including new animal habitats for the tigers and likely for an orangutan that was displaced when SheiKra was constructed. The new habitat in Jungala, Tiger Trails, is located in roughly the same spot as Claw Island. Additional details and images on Claw Island will be added in the future.